Just Listed :: Gorgeous Home in Barnes Mill Swim/Tennis! Welcome home! You’ll love this gorgeous craftsman nestled on a quiet cul-de-sac in the popular Barnes Mill neighborhood. The flowing floor plan, custom features, and charming character of this home will never go out of style. 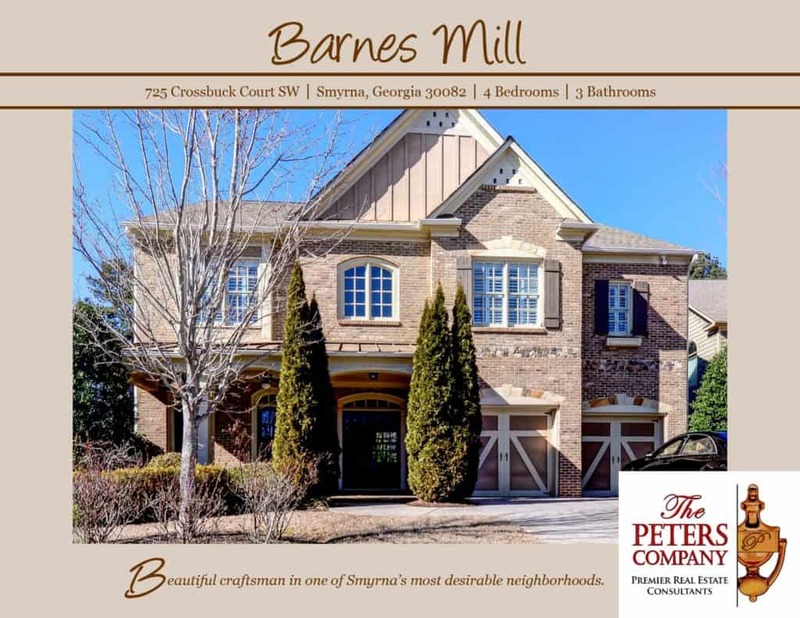 The close proximity to I-285 and I-75 makes this home convenient to and from any direction. You’ll also have easy access to the highways, byways, and activities that make this location such a well loved destination. You will certainly enjoy being only minutes from Smyrna Market Village, Vinings shopping, several city parks, and the 61-mile long Silver Comet Trail too! Loaded with craftsman touches and custom features including upgraded trim work, crown molding, neutral paint colors, and gleaming hardwood floors. Chef’s kitchen features granite counters, stainless steel appliances, island, double ovens, walk-in pantry, and spacious breakfast area. A keeping room off of the kitchen is complete with cozy stone fireplace, vaulted ceiling with rustic exposed beams, and tons of natural light. Separate dining room can accommodate furniture of any size and is perfect for entertaining. The living room off of the two story foyer has doors leading out to the wonderful rocking chair front porch. Spacious family room has coffered ceiling, built-in bookcases, fireplace with stacked stone surround, and large wall of windows that lets natural light pour into the room. Main level bedroom and full bathroom are ideal for guests. Master suite is a true retreat including trey ceiling, sitting area, and two custom walk-in closets. Spa-like master bathroom has double vanity, jetted tub, and separate shower. Two additional upstairs bedrooms are well-sized and bright, have custom closets, and are connected by a popular jack and jill style bathroom. Second floor bonus room has built-in TV and is perfect to use as a playroom or media room. Large 1,000 square foot covered patio overlooks the fully fenced backyard with gorgeous professional landscaping and hardscaping– truly one of the best yards in the neighborhood! Wonderful community amenities include a pool, clubhouse, tennis courts, and playground.